Digital fabrication – from modeling to making – is now enabling and powering manufacturing in small, enterprising businesses everywhere. It’s about the digital technology that lets small producers make complex, quality parts with reasonable pricing and really responsive agility. It’s about local manufacturing, local making, and local producing becoming competitive again. It’s what 100kGarages is all about! 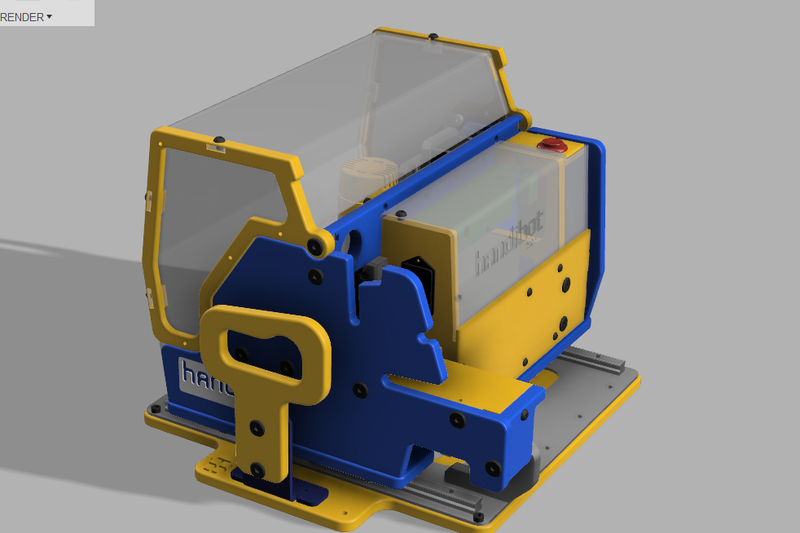 Quick Fusion360 rendering of new Handibot. What has been missing in this scenario are tools to help with the collaboration between customers, designers, and fabbers – tools that would aid in sharing concepts, evolving ideas, and orchestrating manufacturing from start to finish. Sure, there are lots of collaborative tools for working inside big companies on project and product development. This is different, Autodesk’s new Fusion360 platform is a start at providing those tools for small organizations and individuals working together — for us. I’ve been looking at this platform for some time and I think it just might provide 100kGaragers a useful end-to-end resource for the development of product and project designs, prototyping, and manufacturing. It puts tools at hand for sharing models and information at each stage of the workflow. It offers collaboration and communications, and may eventually help with logistics as well as vendor and supply chain management. A most interesting basic feature for 100kGarage users and fabbers is that Fusion360 incorporates design tools and CAM within the same system – automatic toolpath updates when parametric changes are made to a model. Fusion360 is still a work-in-progress, constantly being updated, and its promise is pretty amazing. Although a number of features in modeling and CAM are still missing, progress on the platform over the last year has been, and continues to be, impressive. Spiral gear as Fusion360 model; parallel toolpath; and adaptive machining toolpath. If you haven’t fully embraced cloud storage for all your work, the cloud orientation of Fusion360 can be off-putting. Yet it’s working with that same accessibility that makes possible the ready sharing of projects across a range of devices and users. Let your customer see a model from a project on their phone or tablet – they can mark it up and make notes for you. Or work interactively with a remote fabber/designer on the specifics of a tool path for production. It’s all pretty seamless as sharing and collaboration are at the core of the platform. Fusion360 is available in a number of ways: promotions through tool manufacturers like ShopBot; from the Fusion360 website at a low price for commercial use; and from the website, free to hobbyists and small companies. It is a big download and the main program only runs on PC and Macs with storage and collaboration (as well as other functionality such as rendering) handled in the cloud. Of course we don’t plan to impose anything on anyone here at 100kGarages – we’re a pretty independent bunch – but we really think that Fusion360 could evolve into an important common resource and is probably worth checking out as a tool for your shop. There’s not much to lose and you are likely to get new ways to talk with your customers and collaborate with your partners. Chair layout for production in Fusion360 CAM (from tutorial). By default, the standard set-up of Fusion360 and its CAM component seems oriented to mills and machining centers. 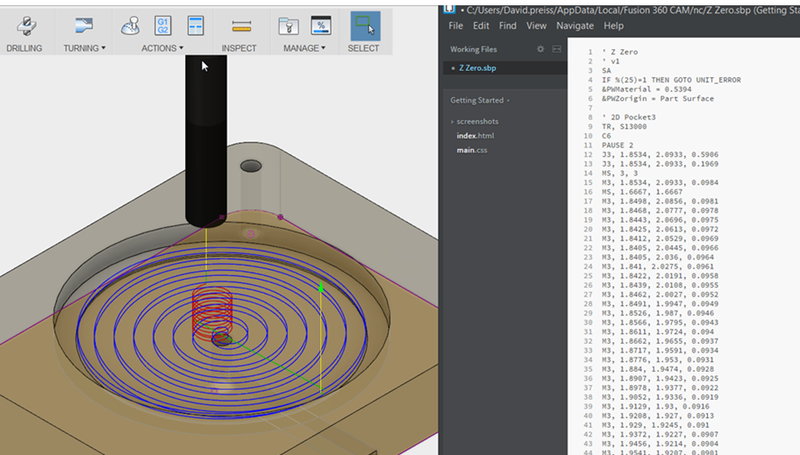 If yours is a CNC-router-based operation, you may want to check out this tutorial on using Fusion 360 (tutorial link!) for a plywood furniture project. The tutorial provides example work flow for a small chair with digital-fab joinery as well as showing how a design is laid flat for production and machined with tabs and dog-bones – it’s a nice demonstration of a sheet goods project and shows some of the power of the platform. 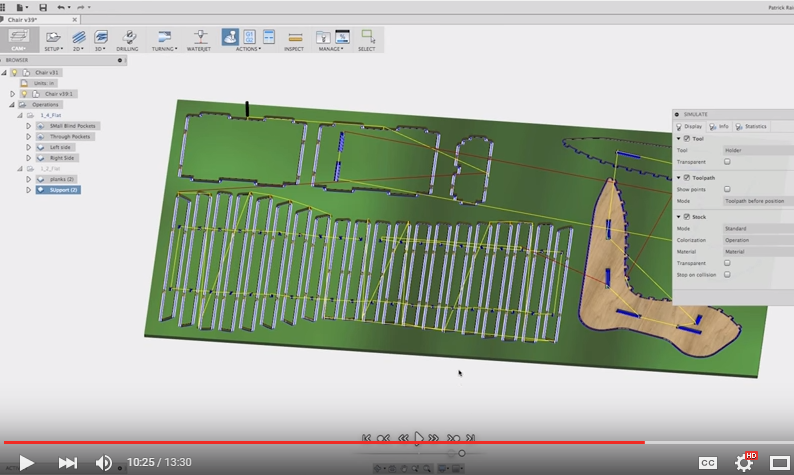 Projected tool path with illustrative output from OpenSBP CNC post. One final note. An interesting thing you will notice when you start up the software is that there is a “Make” button in the Fusion360 top menu. Fusion360 users are now able to send projects straight to 100kGarages to get a quote or find a fabber – so watch out for new job opportunities!